7 Common Problems With Dishwashers – Troubleshoot Your Dishwasher Issues! So what dishwasher problems do you need to troubleshoot? This is probably the most common dishwasher malfunction. The problem is usually as simple as the sink trap or drain hose being blocked. These are the easiest parts to check, but if they seem to be clear it could be that the pump is at fault. This will need to be tested, and possibly replaced – probably by a dishwasher repair specialist. Another common but usually simple to resolve problem is a dishwasher which doesn’t seem to wash dishes – at least, it doesn’t do it very well! Confirm that the spray arms can move easily. It may need to be replaced if not. Check that the upper discharge housing gasket is tightly in place. If loose, it may also need to be replaced. Run a wash cycle using your dishwasher cleaner and no dishes. Finally, check once again that there are no bits of food debris or grease impairing the sprayer arms, door gasket, or strain screen. 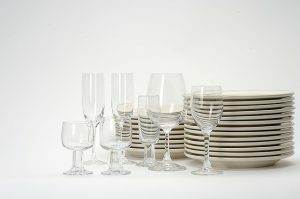 This can be an annoying issue – after all, what’s the point of a dishwasher which doesn’t clean your glasses for you? Usually in this case, the problem isn’t mechanical either. Do you live in a hard water area? If so, you may need to add a specialist product – usually called rinse-aid – to each wash cycle to compensate. You can also adjust your appliance’s rinse settings to alleviate the problem, or use a lower temperature wash.
You can check whether the problem is caused by hard water by performing the “vinegar test” (wipe some vinegar on a cloth and use it to clean any cloudy glass. If the cloudiness comes off, then your problem is due to the water that comes out of your taps). A step up (or down, depending on whether this is the dishwasher problem you need to troubleshoot), an appliance which doesn’t drain at all – and which you’ve already checked for debris – is probably caused by a faulty drain pump or motor, or most likely the check valve in the drain sump. Any of these components might need replacing. You can tell if you need a new check valve by confirming your existing one is not moving properly. Are there any cracks or breaks in the drainage hose? Is the pump seal or pump broken? Is the door gasket sealing properly? Some of these parts can be replaced easily – the door gasket, for instance – while others might require professional assistance. If you’ve traced unpleasant odours in your kitchen to your dishwasher, it’ll almost certainly be a problem with food or grease trapped somewhere inside. Check the strainer screen, the sprayer arm jets, and the bottom edge of the door. Whether not you find anything, run a full wash cycle without dishes. This is another problem which can be quick to resolve, but will require the use of a multi-meter. Check the thermostat, heating element, and timer motor to make sure they’re working correctly.